Although widely and justly considered second–rate works, the library of this legendary sleuth's further adventures has been growing by leaps and even greater leaps the last forty–odd years. A staggering number of these books, of course, wallow in that corner of chilly obscurity especially reserved for epigones. Even an authoritative collection penned by Arthur Conan Doyle's youngest son and Agatha Christie's most heralded contemporary and based on unsolved Holmes cases never fleshed out in print suffers from the ingenious self–limitation of recycling actual Doylean plot lines. Thus, if you are more than superficially acquainted with the original stories, you will see the guilty party marching towards you from the other end of Baker street. Not so with the American author Caleb Carr, who comes up with an entirely new adventure and one not remiss in its Holmesian eccentricities. Carr is the author of this other bestselling novel, which I cannot recommend, as well as a noted military historian. His training in that field must definitely have imbued the villain's weapon of mass devastation (I shall not describe it further) with a certain authenticity, although that is again not my business to judge. What I may say, however, is that the historian finds Victorian dialogue to be a rather delightful affair and, while generally refraining from archaic constructions, dispatches a convincing Watson (no story is complete without him) to lead the reader from room to darkened room in search of, well, a ghost. The ghost has been biding its time for a while now: the Italian secretary in question is none other than this murdered gentleman, once a member of the court of Mary, Queen of Scots, and now still very much bounding about this old palace. Mycroft, Holmes's older brother always described by Sherlock as having the better brain of the two, if beset by irreparable indolence, summons the dynamic pair to Scotland to investigate the evisceration of an architect and a mason. Along the way, a few belligerent Scottish terrorists decide to ventilate the train that the two visitors happen to be riding. We are to gather that this small piece of action will be a foretaste of the revolt awaiting the detectives in the North, although the extreme violence of the novel (a very modern addition) is tempered by the cozy whispers of ghosts and goblin–like baddies from every crevice and crack of Holyrood. Once there, the usual chain of events ensues: Holmes becomes moody and finds the whole operation either tedious or hilarious, while Watson drifts from one shady character to another, inspecting each of them with severe medical thoroughness. Holmes of course knows exactly what's going on and just has to test out a few of his theories to substantiate his peerless intuition; Watson, on the other hand, is tasked to play the role of the silly goat. This thankless assignment involves irrational fears of the supernatural, excessive politeness (especially to the fairest and most distressed of Europe's damsels), and an unerring tendency for absurd deductions based on a hint or a sniff of a clue (or the hint of a sniff of a clue). This is both the trademark of the Holmes stories and its cardinal shortcoming, and Carr smartly chooses not to tamper with a proven product. 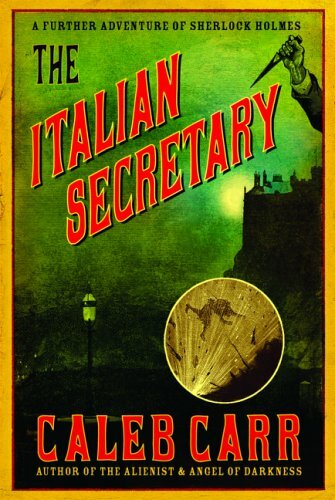 I cannot say I like the end of The Italian Secretary, neither what happens nor how and why it happens. The history of Rizzio's murder is a nice backdrop, but how many Holmesian solutions do we have that truly involve the otherworldly? Despite this obvious straw–man, on most pages Carr offers a flattering and sincere imitation of Watson's unique cadence. More impressively, the reader's attention is held even though the vast majority of the novel are lengthy dialogues: Holmes and his foil, or the Brothers Holmes, or Watson and the young woman he finds wandering the castle. Yes, it's always Watson who finds the woman. Holmes found a woman once, in this, his first short story. Conan Doyle immediately recognized the schmaltzy path that his beloved creation would be taking if he continued in this vein and wisely concluded that some artists should remain monks, or at least keep bees instead of grandchildren. Had he not, it would have been one of the most disastrous decisions in literary history. But perhaps still not as bad as this one.